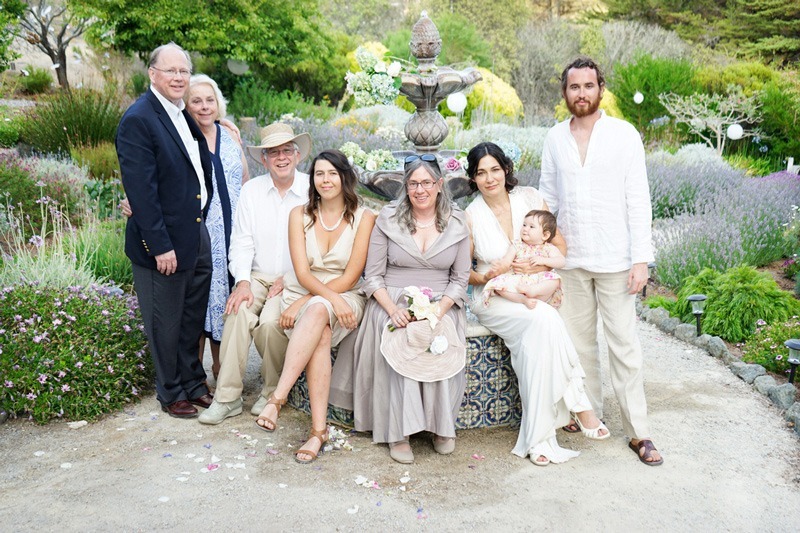 Today I’m happy to share with you a bohemian wedding that took part in Arroyo Grande, California, while the waxing moon, on July 18th. 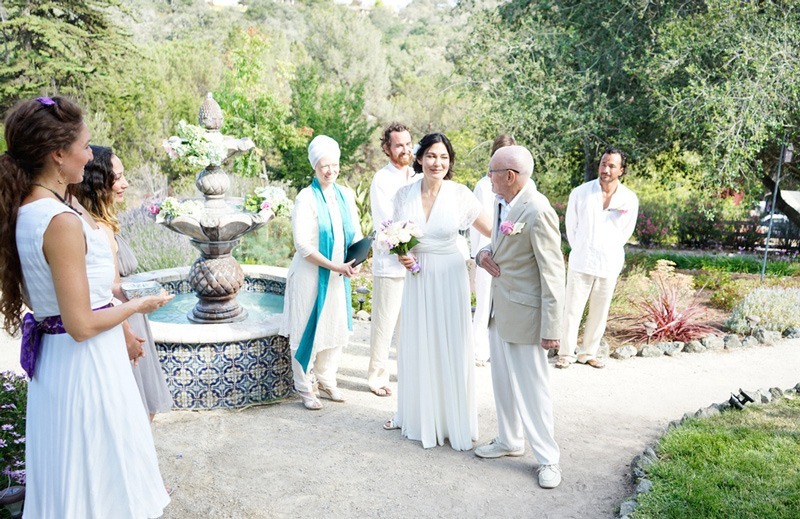 Miki and Sam’s wedding was a magical wedding full of rituals made with the help of their creative friends and family. If you continue reading you’ll find the bride’s spiritual and wise advice, that will make you think about your wedding day from another perspective. Miki and Sam met at an Ecstatic Dance event (a kind of meditative dance practice that enhances consciousness and freedom of expression), in Santa Cruz, through a mutual friend of them. The lovely couple value consciousness, thinking “outside the box”, art, education, nature, traveling, and tend toward a healthy, bohemian lifestyle. When these soulmates meet, they realized that they get a long very well! They were meant to have a family together, and things happened pretty quickly. Less than a year later they were happily surprised to find out that they were going to be a mama and a papa of a baby girl! 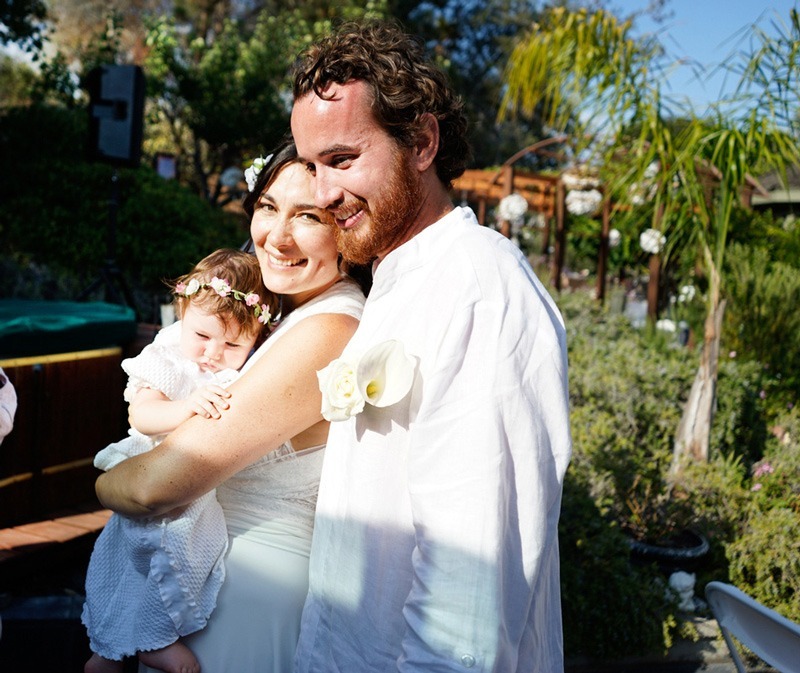 After the birth of their beautiful baby girl Miki and Sam were just so full of love between the three of them, that the marriage part just happened naturally. 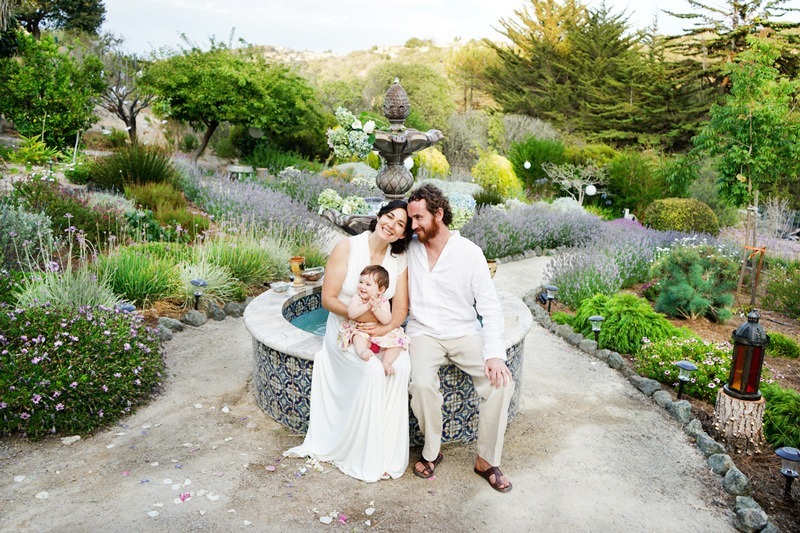 That was last February, and the lovely couple decided to be married on July 18th 2015 in Miki’s mom beautiful garden in Arroyo Grande, California, while the moon was waxing. The waxing moon is considered to be good for new beginnings. 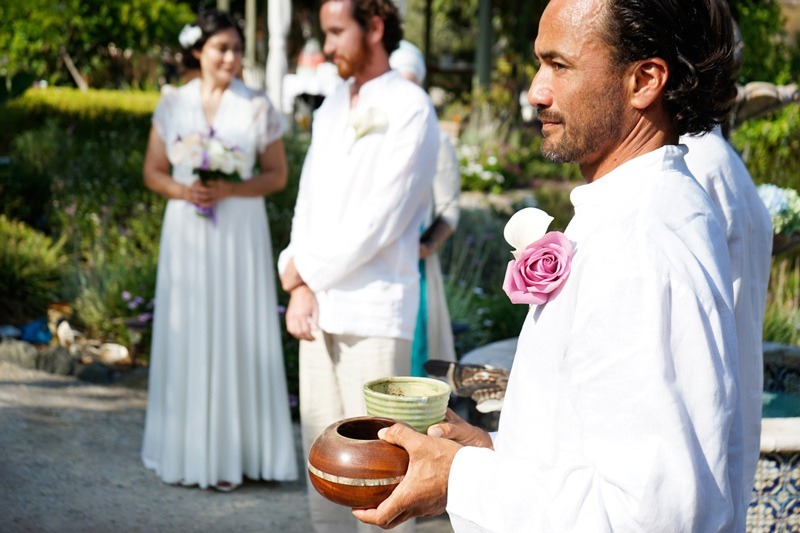 Sam and Miki wanted a small wedding with close family and friends, and the ceremony to be meaningful and allow the guests to have a transformational experience along with them. 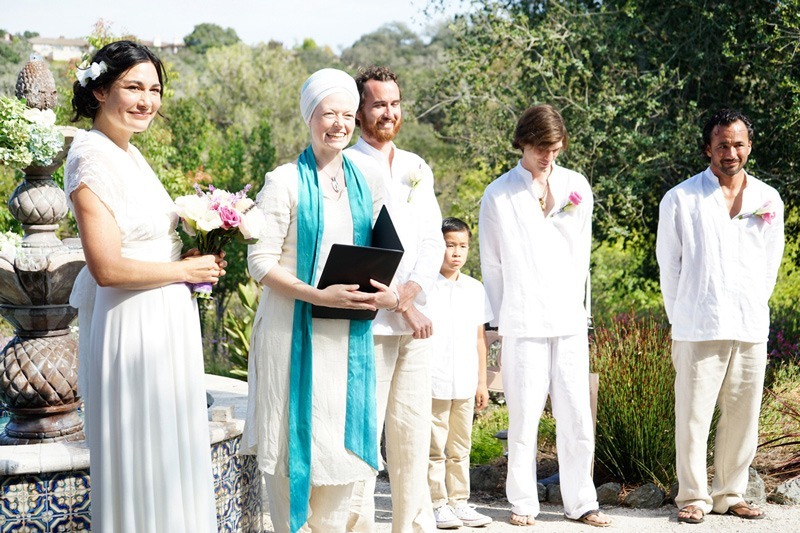 “We asked our friend, who is also a Kundalini yoga teacher and acupuncturist, to officiate the ceremony. 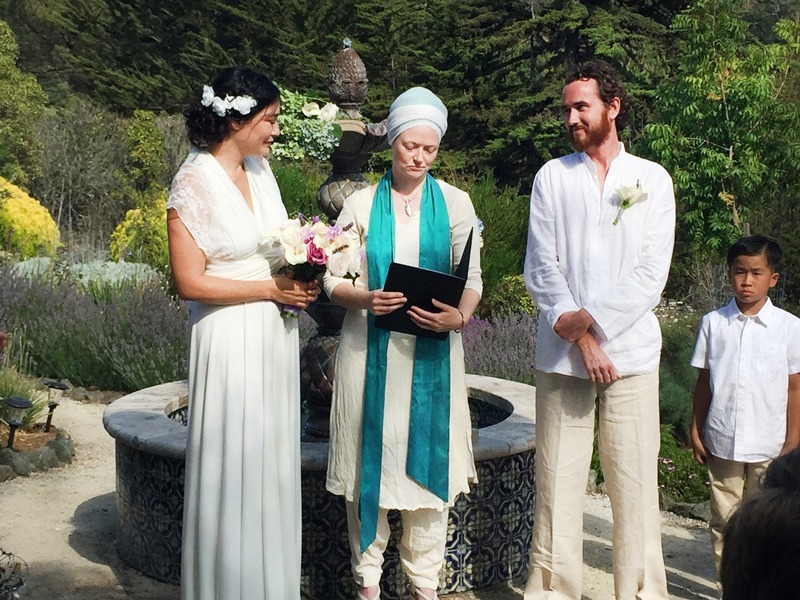 She is such a wonderful, powerful, and light-hearted healer”, says the bride. 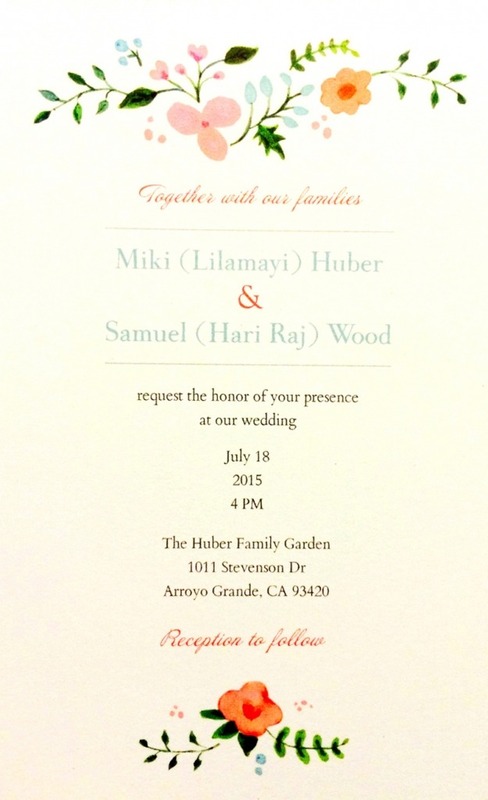 Sam and Miki decided they wanted to celebrate rebirth in their wedding day. 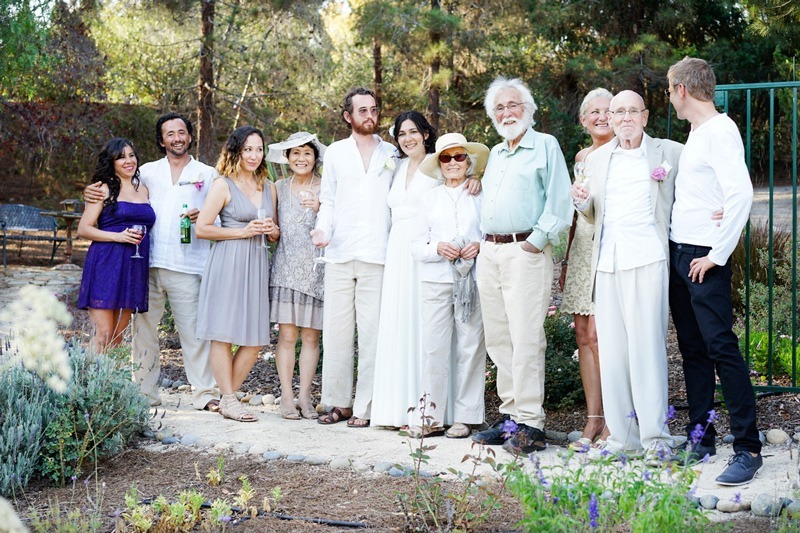 They decided to wear white and encouraged their guests to wear white or light colored clothing. The couple had a lot of friends volunteer to do decorating, cooking, rituals for the ceremony, and helping in everything. Sam and Miki have a lot of creative, artistic friends, so people were willing to live in the moment and improvise. That made the wedding very exciting and extra special. Miki explains me that they had a beautiful soundtrack that included Enya, Mussorgsky, and some beautiful Kundalini yoga mantras. Sam’s sister is a folk musician, and she sang a beautiful version of Come Thou Fount of Every Blessing at the end of the ritual while one of the bride’s maids washed their feet. For this part of the ritual someone brought baby Leia up to sit on Miki’s lap. 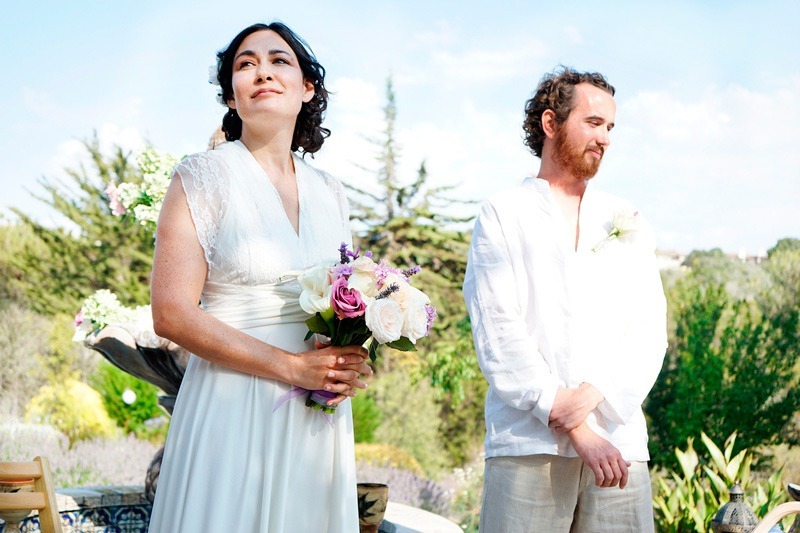 “I wanted a wedding dress that had a timeless and natural elegance. I also wanted to keep within a budget so we could plan wisely for our family’s future. The Mimètik Bcn dress was perfect, and I am excited that it allows for different stylings so that I can wear it again someday to some other special event without it looking like I’m wearing the same dress. It was also very comfortable and easy to move in, and that is very important to me”, says Miki. “The advice I would give to new brides is that it is more important to follow your heart when planning the wedding than following a wedding planning guide. 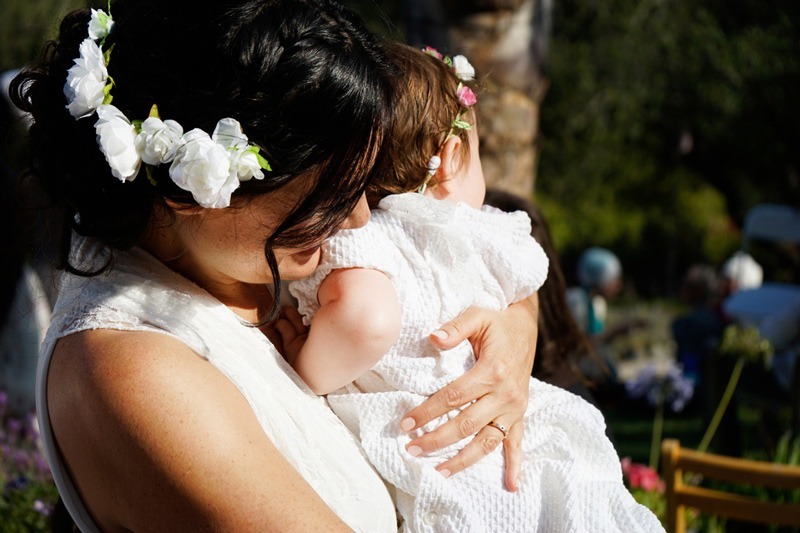 A guide can be helpful to remind you of what possibilities there are, but it’s more important to make the wedding a magical ritual that you and your partner will feel positively transformed by. 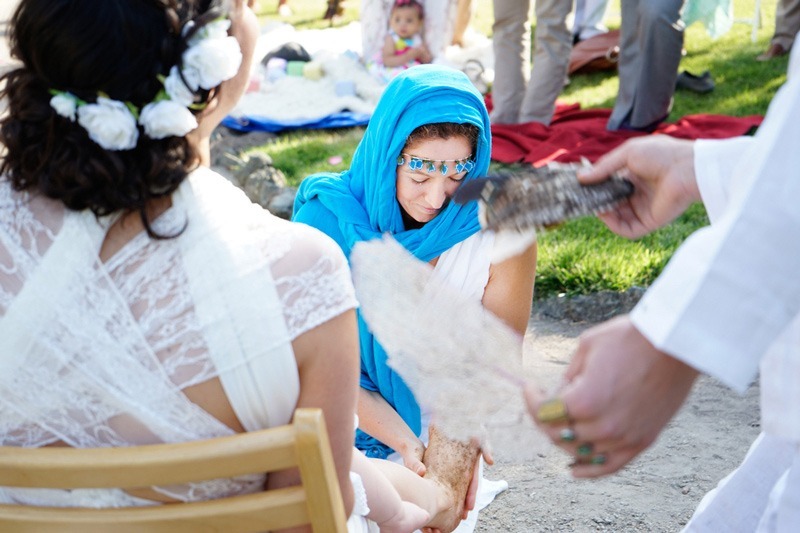 A wedding, in its true essence, is a transformational experience at a soul level. 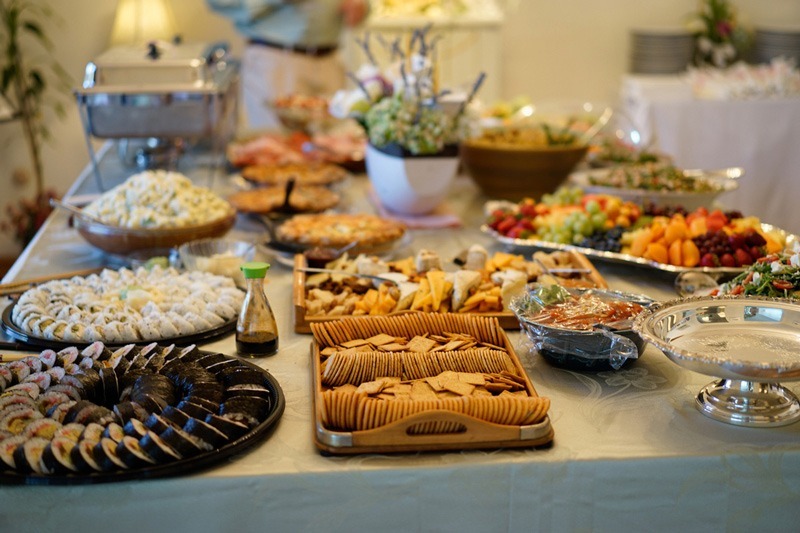 It doesn’t have to be a giant, fancy, expensive affair to be truly magical. Also, when it comes to advice from family and friends, do your best to be polite with them and understanding of their needs, but, in the end, it is your day, and it has to feel right to you and your partner. Thanks a lot to the bride and groom for sharing with us their love story and thanks to you for reading it! 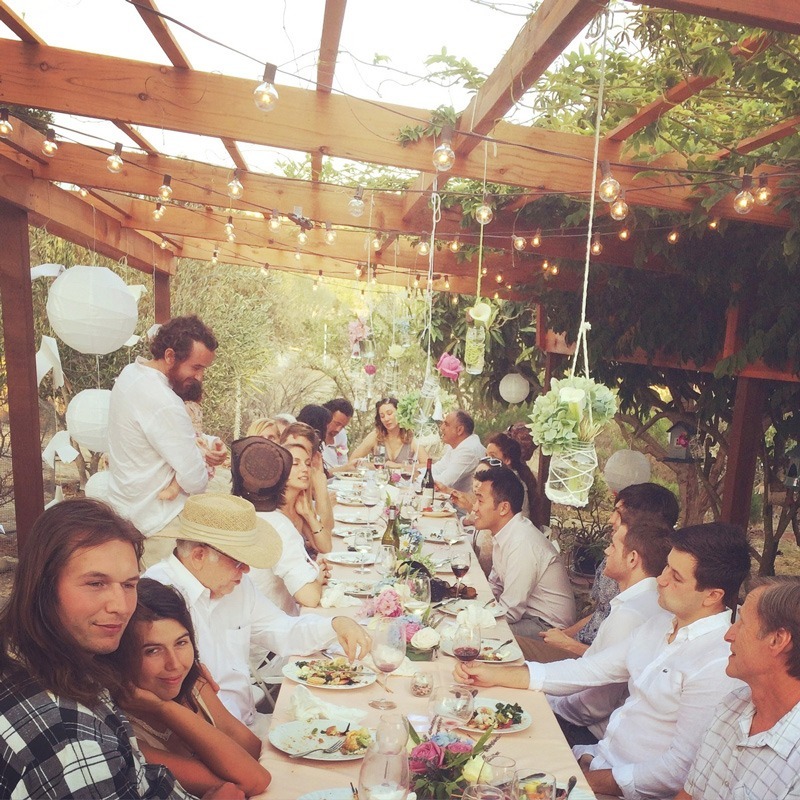 This entry was posted in Blog, Real Weddings and tagged bohemian weddings, outdoor weddings, Wedding in a garden.